Time for another posting with the Insecure Writer’s Support Group, where writers can share their insecurities and encourage one another. 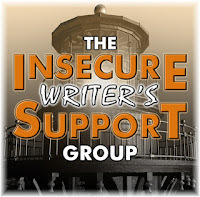 IWSG was founded by Alex J. Cavanaugh and we share our posts the first Wednesday of the month. On Saturday, I was catching up on email and was surprised to find my picture in the IWSG email newsletter. There was a little blurb about me in the member spotlight box and some encouraging words. It makes me feel special and slightly humbled to be included there. Thank you, admins, for the reminder to not give up! Here’s the question IWSG posed for February 7: What do you love about the genre you write in most often? How fun that your picture was in the newsletter! Did you not know that was going to happen? If not, what a great surprise. If that's what appeals to you, write on. We need the inspiration. Glad we could highlight you in the newsletter. I love the art of writing too. :) I'm happy we could make your day with the spotlight in the newsletter. I think sometimes writers forget their work is art and not just work. It's more enjoyable to think of it as creation of art then worrying about word counts or deadlines. Kudos to you for writing inspirational pieces. I considered writing devotionals. I'd really like to do that someday, however for now, I write romance and YA fiction. 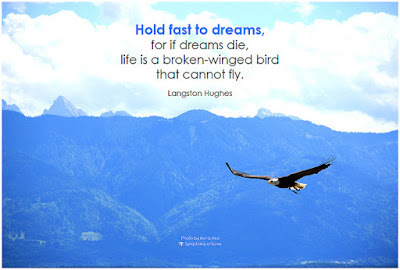 Your quote from Langston Hughes has given me so much encouragement. It has boost me upward. Its great that you enjoy. Inspirational quotes sometimes struck a chord! I like that idea--using metaphors to put unique thoughts into perspective. I have this terrible habit of taking idiom and mixing them--subconsciously--that explain exactly what I'm trying to say. People think I'm being clever. I'm not. LOL. Here's to inspirational writing and making the world better!